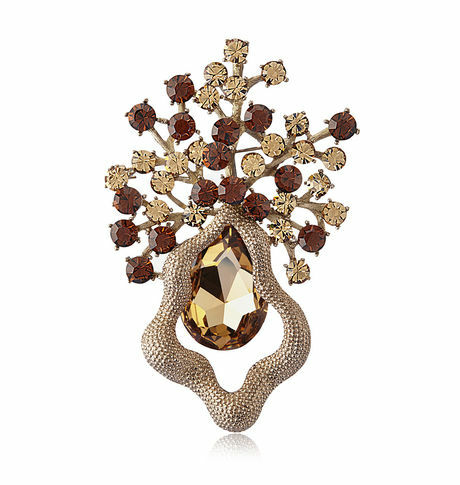 Full of sparkles, this unique chrome colored brooch will make heads turn. One-of-its-kind, the piece is meticulously designed and studded with colored cubic zirconia stones. Team it up with your evening dress and the result is simply spectacular. Full of sparkles, this unique chrome colored brooch will make heads turn. One-of-its-kind, the piece is meticulously designed and studded with colored cubic zirconia stones. Team it up with your evening dress and the result is simply spectacular.Cancellation and Return Policy: • Exchange allowed post booking • No order cancellation or Refund transaction allowed at the store.